Amateur Photographer (AP) magazine has launched a Facebook page dedicated to its long-running campaign to defend photographersu2019 rights. Amateur Photographer (AP) magazine has launched a Facebook page dedicated to its long-running campaign to defend photographers? rights. The weekly title regularly reports and campaigns on photographers’ rights and has been at the forefront of shaping Government policy. In recent years the magazine?s staff have relayed concerns about photography in public at numerous meetings with Government ministers, MPs and counter-terrorism officials. 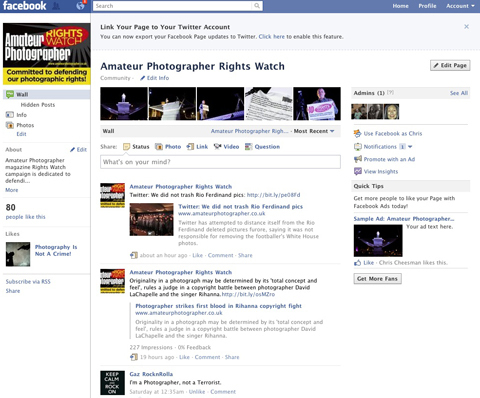 The Amateur Photographer Rights Watch Facebook page aims to further help ensure photographers’ voices are heard, loud and clear. AP?s Rights Watch campaign dates back to 2005 when an innocent reader was wrongly accused of helping to plan a missile attack on Canary Wharf in London by taking ‘reconnaissance’ photographs. However, the magazine’s campaign also urges photographers – both amateur and professional – to report on other areas of concern, such as suspected copyright infringement. Amateur Photographer is the world’s oldest consumer weekly photographic magazine, first hitting the newsstands on October 10 1884.